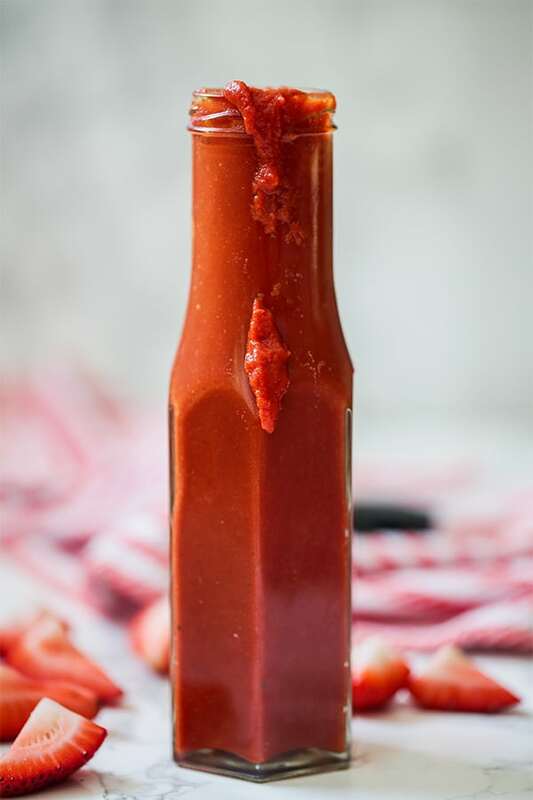 This Strawberry Balsamic BBQ Sauce is a nightshade-free BBQ sauce that’s paleo and AIP! It’s smoky, sweet, and tastes just like the real thing for those who can’t tolerate tomatoes. There’s no escaping BBQ when you live in Dallas, TX. Ribs, brisket, and creamed corn on the side are a way of life here. Being nightshade intolerant isn’t easy and has always made me stick out like a sore thumb. When everyone decides to pile into the truck and go to a BBQ joint, I’m left sitting hungry and sometimes can’t even handle the smell of all of the spices. I never thought I’d be able to enjoy BBQ sauce, even at home again. 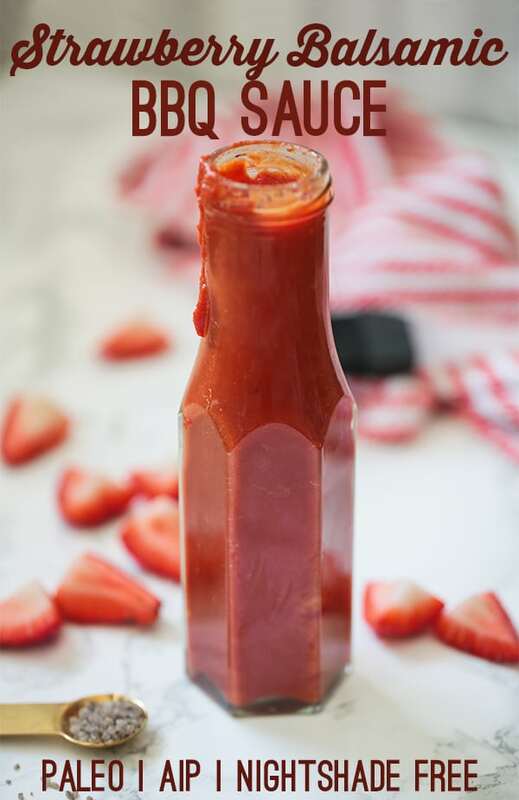 That’s why I made this paleo and AIP Strawberry Balsamic BBQ sauce! 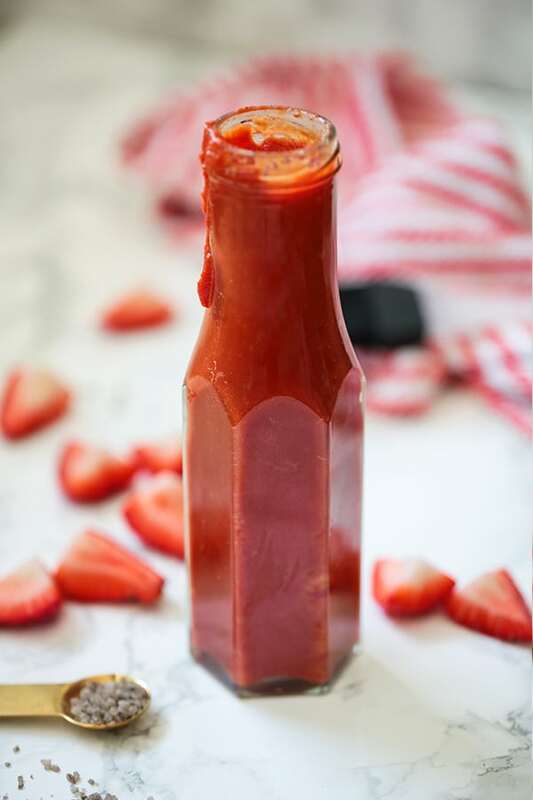 This strawberry balsamic BBQ sauce is perfect for adding flavor to your favorite dishes this summer. It’s completely nightshade free, paleo, and AIP friendly. These veggies make up the base of the BBQ sauce and are what gives the sauce its color. If you’re scared of beets, don’t worry! You really don’t get the beet flavor in this sauce at all. The other flavors mask it. This gives the sauce color and some added sweetness without making it overly sweet. Balsamic and strawberries are such an amazing combination, and that rings true for this sauce. It gives it the perfect amount of acid and tons of flavor. BBQ sauce typically has a lot of sugar, but this sauce only has 1/4 cup of maple syrup for the whole batch. Technically, you can try to sub it with just water, but it will take some of the flavors away. This is probably the most important ingredient in the whole sauce. It’s what gives it that smoky, BBQ flavor. You may feel tempted to swap this with just sea salt, but I beg you, don’t do it! It just doesn’t taste quite like BBQ sauce without the smoky flavor. Plus, the smoked salt is an amazing addition to your spice cabinet. You can buy it online, but I’ve also found it in most stores. Using a medium-sized saucepan, melt the coconut oil over medium heat. Add the onion and saute for 2-3 minutes. Next, stir in the beets and carrots and saute for 5 minutes or until lightly softened. Pour in the liquids and add the remainder of the ingredients and stir well to combine. Reduce heat to a simmer and simmer on low for 15-20 minutes, stirring occasionally. Once the sauce is reduced and the ingredients and soft, remove the sauce from heat and allow to cool. Use an immersion blender or a high-speed blender to blend the sauce. Add extra seasonings like more salt to taste if needed. Store in the fridge for up to 3-4 days and serve as you would any BBQ sauce. What kind of beets do you use? Canned, raw, roasted? Thanks!! This is seriously amazing! I’m not eating nightshades due to an elimination diet I’m on, and your site has been a life saver. I’m a huge fan of BBQ sauce, and have hated giving it up. So happy to finally have one I can eat!